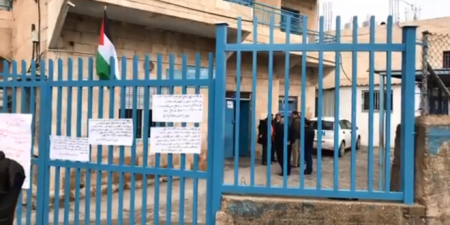 The Palestinian youth movement on Monday organized a protest in front of UNRWA headquarters in Bethlehem and closed down the office, in response to the cuts of the agency’s services following U.S. administration decision to cut aid to the Palestinians. Mohammed Abu Srour, a youth activist, said that the movement’s main demands were for the UN to set a specific budget from the General Assembly to the Palestinians, and activate the role of UNCCP which is responsible for protecting Palestinian refugees and their rights. “We have eight demands that we made in a statement for UNRWA regarding its cuts. The most important being the emergency program that supports many families, which was suspended after Trump’s decision to cut aid, an escalation which Palestinian refugees believe could harm their interests as a means of pressure. The movement held the UN responsible for the cuts, demanding it to revive its servecvis to the Palestinian refugees, mainly patient referrals to the medical clinics, and schools. When the Agency began operations in 1950, it was responding to the needs of about 750,000 Palestine refugees. Today, some 5 million Palestine refugees are eligible for UNRWA services. Nearly one-third of the registered Palestine refugees, more than 1.5 million individuals, live in 58 recognized Palestine refugee camps in Jordan, Lebanon, the Syrian Arab Republic, the Gaza Strip and the West Bank, including East Jerusalem. UNRWA human development and humanitarian services encompass primary and vocational education, primary health care, relief and social services, infrastructure and camp improvement, microfinance and emergency response, including in situations of armed conflict. “Contrary to some reports, there was no strike in Gaza today and UNRWA installations across Gaza were not closed because of industrial action. There was a memorable and peaceful solidarity walk by thousands of UNRWA employees from our office in Gaza City to the UNSCO office to hand over a letter to the President of the General Assembly, expressing concern about funding reductions and their potential impact.